A neck lift is the perfect solution to the question, “What can I do with my saggy neck?” or “I want to get rid of this excess neck skin”. • Remove your unwanted fat in your neck and under your chin. The goal is to recreate a well-defined jaw line, and repositioning of the soft tissues of the neck to a more youthful and smooth contour. In other words, give you back your neck of earlier years! In Seattle, there are many types of neck lifts and which one would be best for you depends upon your concerns and goals for improvement in your neck as well as your neck anatomy or structure. Solutions to improve your saggy neck skin, double chin or neck fat, neck waddle or turkey neck are varied and need to be customized to you and your specific cosmetic goals and needs. If you have a weak chin that may be contributing to lax neck skin. The amount and strength of your neck bands. The quality of your neck skin. A neck lift can be an extremely rewarding surgery if you are a candidate. If you are healthy, in reasonable physical shape, and at a stable weight you are likely a good candidate for a neck lift or mini neck lift. Smokers, patients with multiple or untreated medical problems, and individuals who are psychologically unprepared for surgery are not good candidates for a neck lift. Kybella is a “neck lift” without surgery. It is really a non-surgical neck lift procedure that can be a simple and effective neck fat removal solution for some people (usually people who have good tone in their neck skin). It is a non-surgical solution. Kybella is a series 2 to 5 of injections spaced out a month apart that can be used to lift the neck or remove unwanted neck fat. It is perfect for the patient who has some fa under their chin that they do not like and they do not want to undergo surgery. Liposuction of the neck is also a good solution for excess or unwanted fat of the neck especially for patients who have good skin tone in their neck. This is generally the younger patient. Even though liposuction is a surgery, as opposed to Kybella, it is one treatment and can be done with local anesthesia or conscious sedation and is minimally invasive. Liposuction of the neck is usually performed through tiny incisions behind the ear lobe and under the chin so that there are really no scars. It can involve the use of laser liposuction such as Smart Lipo to try to tighten the skin but the results for skin tightening are mixed and Dr. Windle finds that the use of SMART liposuction with tumescent liposuction techniques gives as good if not better results for neck fat removal or tightening. 2. Removal of excess or baggy skin of the neck by re-draping up toward your ears where the incisions are for a neck lift. The technical term for this is a cervicoplast. 3. Tightening of the muscles of the neck by either pulling them back of suturing them together in the middle of your neck and under your chin. This is done to improve the muscle “banding” from redundant and loose platysma muscle visible as sharp vertical lines in the neck. The technical term for this is a platysmaplasty. The result of a neck lift is the reversal of the effects of aging in your neck which include loss of elasticity in your skin and the pull of gravity. The goal is to recreate a well-defined jaw line, and re-positioning of the soft tissues of the neck to a more youthful and smooth contour. The cost of a neck lift may be a little more than the cost of a mini neck lift but usually well worth the additional cot if you are not a candidate for a mini neck lift. A mini neck lift is a scaled-down version of a traditional neck lift. It’s called a mini lift because the incision is smaller, less overall work is performed and the recovery time is frequently quicker. A mini neck lift cost is usually what attracts patients to research this solution to their neck problem first. If you’re in your mid-forties or early fifties and your neck is showing a neck waddle you may a candidate for a mini neck lift. A short incision is made near each ear. Unlike a regular facelift or neck lift, nothing much is done with the muscles. Rather the skin is gently pulled up and tightened. Thus, it usually does a good job with reducing loose skin. Invasiveness is reduced with a mini neck lift. Mini neck lift surgery can be easily performed under local anesthesia. A mini neck lift is one of the few times we can take 5-10 years off your face in an hour! A suspension neck lift uses sutures to lift the neck by creating a hammock of suture in the neck. This can be done under local anesthesia and the recovery is quite fast. Some surgery call this a feather lift but newer techniques call for multiple sutures that are placed though small incisions behind the ear lobe and under the chin. 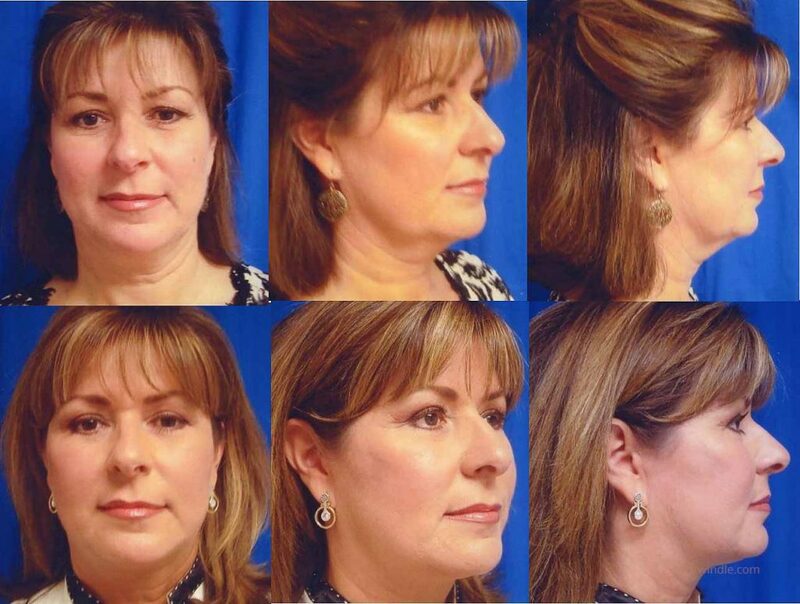 Chin augmentation using chin implants can act to lift the neck by pulling the neck skin out. A chin augmentation is sometimes used in combination with a variety of neck lift procedures to help make the chin-neck angle sharper and more defined. A neck lift will last forever! However, you will continue to age. In the future, you will still appear younger than if you had not had your procedure, but you should not appear tight, “overdone” or abnormal. The goal is to give you neck lift so that you have a smoother, more youthful appearance that will endure in the long term or age with you. Can other Surgical Procedures be Done Together with a Neck Lift? A neck lift can be done by itself to improve your neck, the jaw line and possibly the mouth area but does not specifically address the mid-face, the forehead (“brow”) or the eyes. A complete facial examination will be done at your consultation to elucidate which surgical option(s) will best achieve your goals and most accurately treat your specific features of aging. Facelift to smooth wrinkles and correct aging in the cheeks, mouth region and mid-face. Brow Lift (Forehead Lift) to gently lift and refresh the brow, helping to create a more youthful appearance to the eyes. Filler injections like Bellafill for treating lip lines, lower eyelid bags and the marionette lines that are not corrected very well by any of the surgery “lifts”. Chemical peels like a phenol peel or Croton oil peel. These peels can be used to correct sun damage and fine lip wrinkles and wrinkles around the eyes and nose. What is the Recovery After Neck Lift Surgery? Dr. Windle uses rapid recovery techniques and special anesthesia in your neck lift surgery called tumescent anesthesia to reduce pain, swelling and bruising. This dramatically shortens your down time and most patients say that they are back to doing most things in public within a week. However, some bruising may still be present and you may need to wear some makeup to cover things up. After any type of facial plastic surgery, swelling and bruising is both normal and expected. There may some asymmetry of your result due to swelling and bruising. This is also very common and should resolve as your healing progresses. Some surgeons suggest that sleeping with a few extra pillows to elevate the head can help speed the resolution of postop swelling but getting a good night sleep is more important, so I recommend sleeping whatever way you need to get your beauty rest! Prior to a neck lift, some patients grow their hair a little longer than usual if it is short to help conceal any incisions in front of the ear during healing. We do recommend that you wait to have your hair colored until your neck lift incisions are completely healed so you may want to visit the salon a day or so before your surgery for your color appointment. All the sutures that I use are dissolvable but there are usually some staples that do not dissolve on their own will be painlessly removed in the office within a week of your neck lift surgery. When you are considering any type of surgery, you should be fully educated about potential risks and complications. While a botched plastic surgery of botched neck lift is always possible, everything that Dr. Windle does for his Seattle area neck lift and facelift surgery patients is designed to reduce complications, downtime, and invasiveness. Where Can I See Before and After Photographs of Neck Lift Surgery? Before and after neck lift surgery results will be reviewed during your consultation. 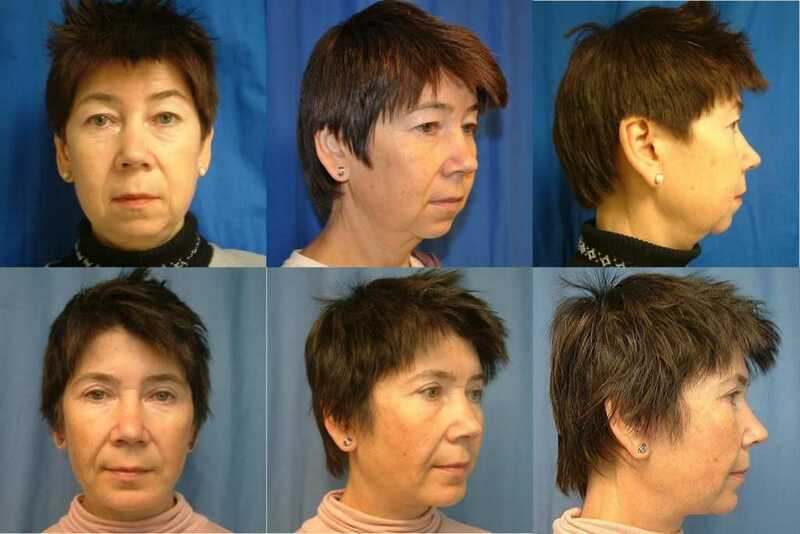 Neck lift, facelift and mini neck lift before and after photos of real Seattle patients can be seen in Dr. Windle’s before and after photo gallery. How Do I Know Whether a Neck Lift is Right for Me? What you see in the mirror can impact your self-image and self-esteem and Dr. Windle recognizes this. At your neck lift and facial rejuvenation consultation, Dr. Windle will spend a great deal of time with you to get to know you personally, review your medical history and then discuss your specific aesthetic goals. Most often he will stand back and analyze your facial bone structure, underlying skin composition, skin thickness, texture and elasticity, and the extent of facial wrinkles and folds. He will then give you neck lift options that will address your unique features of aging and match them to your outcome goals. Together, you and Dr. Windle will select the surgical technique that will obtain the best outcome for you while offering the lowest potential risk. Simply contact the office by phone, email or by completing our contact form and we will set up a strategy session with Dr. Windle so that you can decide if a neck lift is right for you. START YOUR NECK LIFT JOURNEY NOW!